Here’s another from my recent trip to the Rio Baker, or Baker River, in Patagonia, Chile. In this photo, Santiago Ibanez is running the very first rapid on the river, a relatively small drop from a calm pool into a tumbling turbuent pool. Santiago ran the drop several times during our trip, and this was probably his sweetest line. He paddled back over to me after the drop with a huge smile, and said how good it felt. I was grinning from ear to ear myself, because I’d already viewed this photo, and was just as happy aas he was. I showed him the image on the LCD on the back of my camera and he loved it. I knew I had a nice chance of catching a little rainbow in the frame, and the line he took put him right in the middle of it. Thanks for a great photo, Santiago. Photographing whitewater kayakers is tons of fun. Just being that close to such action is an adrenalin rush in itself. On this trip I was extra lucky; I had a great bunch of paddlers to work with, and they were as excited as I was to be there, and they were very willing to co-operate with the photographer (for a change!). I knew Santiago from the summer, working on the Futaleufu river, and as we hadn’t worked together a whole lot it was nice to hang out with him on this trip to the Baker river, and get to shoot him kayaking. Santiago also bought his playboat, a Wave Sport Zero Gravity, and everyone had a great time in that boat on a surf wave at the take out. I’ll post a photo of him surfing on that wave in the next day or so. Kayaking on whitewater in a river like the Baker is only for solid Class 5 boaters, with plenty of big water experience. The Baker is definitely some of the biggest whitewater anywhere, and not to be taken lightly. This river runs anywhere from 30 000 cfs to 50 000 cfs, and even higher at times. If you’re interested in a trip to the Baker, be careful. More whitewater kayaking photos. 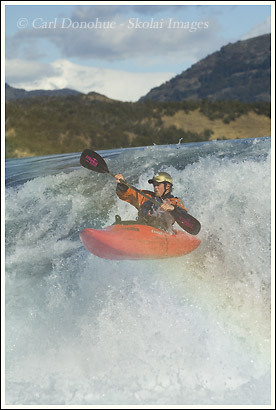 This entry was posted in Adventures, Chile, Kayaking, People on April 27, 2007 by Carl D.